Rhythmbox to Return As Ubuntu 12.04 Default Music App? - OMG! Ubuntu! 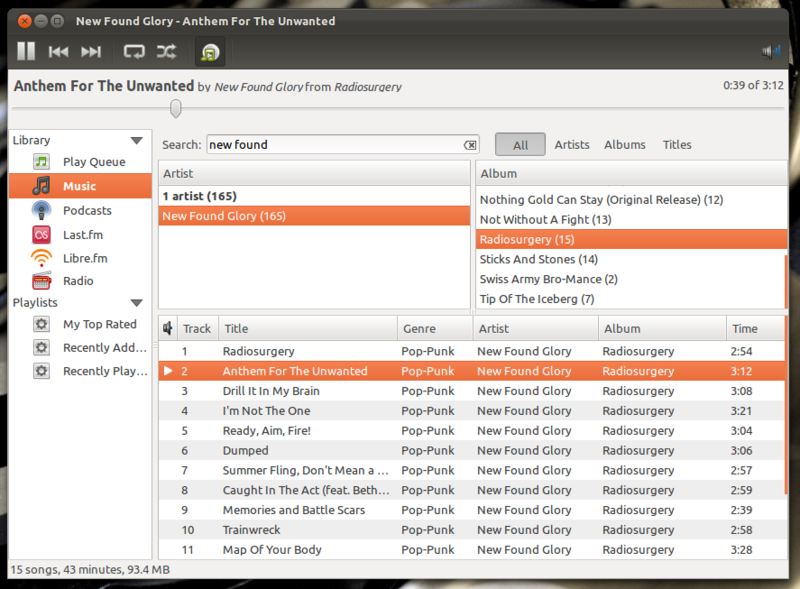 Rhythmbox to Return As Ubuntu 12.04 Default Music App? What applications will be shipping out-of-the-box in Ubuntu 12.04? The bi-annual ‘default apps’ discussion taking place at this weeks Ubuntu Developer Summit has tasked itself with locking in a set of preferred choices. The most important consideration for the default apps in Ubuntu 12.04 is support. With Ubuntu 12.04 is a Long Term Support release, set to be supported for five years post-release, careful consideration has to be placed on which applications ship with it by default and how much support is likely to be lined up behind them. The default e-mail application will remain Thunderbird, and various features and tweaks, such the making the ‘compose’ dialog open in a new tab and not a new window, will be worked on over the next 6 months. Firefox remains the default web-browser of choice;�LibreOffice remains the default office suite. Some form of calendar application – which could be as simple as Google calendar integration into the Indicator Datetime applet- is desired, but with much work to do elsewhere, and too few ‘drop-in solutions’ readily available, hopes shouldn’t be pinned to high on seeing this�materialise in Precise. Amongst the various traditions that rock up at every UDS is the age ol’�tussle�between�fans of�’Banshee’ and ‘Rhythmbox’ for the spot as Ubuntu’s default music player. Rather unexpectedly to most in the room, the case made for Rhythmbox was so strong that it is likely to usurp Banshee on the default install. Amongst the arguments for switching ‘back’ were thoughts to LTS-to-LTS upgrades (Rhythmbox was the default music player in Ubuntu 10.04); the fact that Rhythmbox can deliver a native GTK3 experience in Precise (Banshee GTK3 port is still in development); and then the dedicated developer currently maintaining the app. There would be a handful of hhiccups to resolve: the Ubuntu One Music store would need to be ported to GTK3, and Unity’s Music Lens would need some minor reconfiguration inorder to search the Rhythmbox library. A switch to Rhythmbox would also free up some much needed space on the Ubuntu CD. The deal is far from sealed. Much like the ‘tentative’ replacement of Evolution with Thunderbird last cycle, there are likely to be various detailed implications of a switch that won’t be fully revealed until later on in the cycle; and, it has to be said, developers were very�firmly�split 50/50 over which should be default. GNOME 3’s file-previewer ‘GNOME Sushi‘ was debated for inclusion, but with the tool not respecting button placing, system theme or Ubuntu’s nifty Overlay Scrollbars, the decision was taken to not include it in Precise. A form of System Hardware Information monitor was mooted, and would of�particular�help for the casual user when needing to list their graphics card or chipset in help forums. It was unclear whether a tool was needed, or whether an extra entry in the Control Centre would suffice. PiTiVi was suggested but knocked back due to poor reviews within the Ubuntu Software Centre.